QUOTE OF THE DAY: The two most important days in your life are the day you are born and the day you find out why. 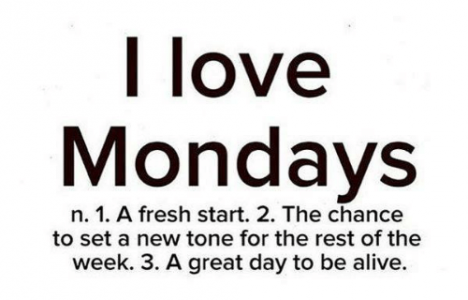 This Monday is a brand new day that has never happened before and that will never happen again. Today you have the unique opportunity to influence another person’s life. Today is a great day to be alive and to celebrate life one day at a time. Today is a unique gift. Unwrap it. Enjoy it. Explore it. Play with it. Today is a gift and there will never again be another Monday like this. So go out into the world and shine your light brightly for all to see! That could look like a random act of kindness, a smile, a hug, or it could mean showing others by leading by example. So be the change in the world you wish to see. AFFIRMATION OF THE DAY: Your life only gets better when you get better. Your outer world will always be a reflection of your inner world. If you want to improve the quality of your outer world you must go to work on yourself. Since there’s no limit on how much better you can get, there’s no limit to how much better you can make your life. I went to an event called Daybreaker on Wednesday, March 14th and it was pretty inspirational and awesome! Basically, it was a yoga session from 6 a.m. to 7:00 a.m. and then an all out dance party from 7:00 a.m. to 9:00 a.m. It was an incredible way to start the day! At the end of the event, we read the quote above all in unison and it was very powerful. Just be you! Live your truth. Most people go through life living a lie ~ pretending to be someone they are not….and they are miserable. Live your truth. You only have one life to live. Live it your way. If family or friends do not approve – that is their problem. Do not make it yours. What people think of you is none of your business. To thine own self be true. Being yourself unblocks your energy. It frees you up. It allows you to live from your power. The world is waiting for you. I am totally adequate for all situations. I choose to feel good about myself. I am worthy of my own love. I stand on my own two feet. I accept and use my own power. It is safe for me to speak up for myself. It does not matter what other people say or do. What matters is how I choose to react and what I choose to believe about myself. I willingly release any need for struggle or suffering. I deserve all that is good. I am wonderful, and I feel great. I am grateful for my life. I have the self-esteem, power, and confidence to move forward in life with ease. I am a radiant being, enjoying life to the fullest. Know that fresh starts don’t come by the calendar year, they come each day. Every sunrise is a new chance to work on becoming the person you were always meant to be, so it’s never a wash if you slip up. Use these missteps as an opportunity for growth. Not sticking to your workout schedule? Consider joining a running group or getting a gym membership that charges you for missing class. Not making headway on your side hustle? Block off a “no-phone zone” for a couple of hours each day where you are heads-down on your project. At the same time, find ways to automate decisions that are sucking time so you can reserve brain power for what really matters. Whether it’s meal prepping, adopting a uniform, or hiring a maid, see what happens when you make space in your mind for the most critical tasks. THOUGHT FOR THE DAY: Do one little extra thing every day! When you look at your goals and your life and the things you want to accomplish I want you to think about doing one extra little thing today to go for it. Maybe it’s one little extra effort or push in your workout. Maybe it’s one little thing you organize in your life for 5 minutes. Maybe it’s 5 minutes of starting to meditate. Or maybe it is something completely different. Doing one little extra thing over time can compound and really make a big difference. One little extra thing done consistently can yield maximum results. Refuse to settle for an average life. Refuse to believe in the impossible. Do not stop believing there is more to life than your current situation. Do better. Walk your own path. Do not settle for an average life. AFFIRMATION OF THE DAY: I am powerful in so many ways. Honor your gifts, your talents, your achievements. Your best efforts are powerful! QUOTE OF THE DAY: We are what we repeatedly do. Excellence, then is not an act, but a habit. QUESTION OF THE DAY: What if you surprised yourself today? What if you surprised yourself with your ability to conquer your problem? What if you surprised yourself with your own rare and brute strength? What if you surprised yourself and found that you had what it took to face that giant impossible problem? What if you surprised yourself and did that thing that scares you most? What if you took the risk and it paid off? What if you surprised yourself with the strength to go through the most difficult and hardest parts of your life? What if you surprised yourself with the gift of showing up and just being there for another person? What if you surprised yourself and took the next step in your recovery process from your addiction? What if you surprised yourself today? I have been getting so many letters from fans that literally feel lost in this world. When they tell me my music gives them comfort and shines a light in a dark tunnel inside their head it literally makes everything I do worth while. Sometimes it feels like the outside world wants you to act a certain way, look a certain way and this can put a lot of pressure on your shoulders. Others may appear to be better looking and more successful, which can create dark clouds in your head. This single is an anthem for those who are searching for their identity and the statement is simple: everybody’s somebody, nobody’s nobody. Life is not about what others expect you to be, or what you feel you might never achieve, it’s about accepting who YOU truly are and being proud of your own personal achievements. Each moment is a fresh new moment for me. I feel joy and contentment in this moment right now. I have peace and inner joy. Today I will listen to my body and give it what it needs. I will make healthy choices today in my steps and in the ways I fuel my body. I will drink lots of water and fruits and vegetables today. I am thankful for this day. I live fully in the present moment. I am calm and happy.